Our collective response seemed simple enough: Muslims needed our support as the race-baiting would likely continue and grow with a following. We decided to name the October 2016 St. Francis Day “Listening to Muslim Voices in an Election Year.” We spent the following months contacting mosques and Islamic Centers in Massachusetts in an attempt to find speakers who could address the growing Islamaphobia, being driven to extremes by the Republican presidential nominee and his base. As a result, we received responses from Muslim speakers, primary among them Mohammad Bajwa, leader of the West Springfield Muslim Society, who also located a Muezzin or prayer leader who called us to prayer on Agape grounds. Nevertheless only ten or so Muslims joined the crowd of several hundred that day, our first warning that being white Christians, even though we were calling our event “Listening to Muslim Voices”, still meant that a Christian community hosting such an event could present a barrier to Muslim sisters and brothers even if our intention was to support them. A few years before the Muslim day, we asked a local Native leader to bless the planting of a cedar tree considered sacred to Nipmuc Natives from our area. When I shared with this easily engaged Native elder that we were a Christian community, his response was clear: “Oh no, I could never come to your community”. 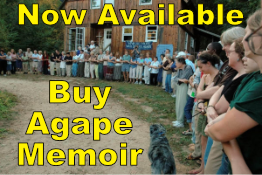 We at Agape knew then we had some soul searching to do. As we considered the specifics of the event, Suzanne offered a wild proposal: “Why not invite the Chief of Standing Rock, Arvol Looking Horse?” A great idea, I thought, but I knew he would be almost impossible to locate, yet alone agree to travel all the way from North Dakota to Agape. Through an odd coincidence, Suzanne found a Facebook post with information about a Standing Rock activist. We got in touch with her which led almost immediately to contact with Paula, the Chief’s wife whom Suzanne immediately contacted. Within 48 hours Paula agreed that she and Chief Arvol would come to Francis Day in October. I attended a major three hour-long Interfaith service where six denominations of Christians and a Catholic Jesuit spoke to the gathering of hundreds. As he attentively listened to seven testimonials from Christians, Chief Arvol seemed to stand in the aura of nonviolent mercy and acceptance that was Standing Rock. In a conversation with Chief Arvol, I asked with some trepidation: “Is it Ok to ask for forgiveness of Native peoples for how they had been beaten, driven off their land and killed?” He quickly answered, “Yes”, then paused and added, “But it depends on who you are.” I assumed that he meant that there would be no easy forgiveness and that asking for mercy needed to entail a repentant and humble request to be taken seriously by Native Peoples. We had to ask ourselves: How do we navigate the painful terrain of Native American trauma resulting from centuries of our violence? Were it not for the generous help and council of Chief Arvol, Chief Cheryl Holly of the local Nipmuc tribe, John Gentle Hawk, Nicole Braithwait-Hunt and members of the Worcester Inter-tribal Indian Center, we would have “fallen down” more often in our planning. Given our country’s origins as a white Christian nation, whose founders built the American economy off the backs of enslaved Africans, it was very clear that we white Christians had more listening to do. In recent years, with the rise of White Nationalism, the depraved and unrelieved injustice of enslaving and oppressing African-Americans, starting from the arrival of the first slave ships in 1619 to the present, comes into compelling view. Ten of Americas first twelve presidents were slave owners. We decided to experiment with asking people of color not only to present themes of racism, but also to lead the prayer, music and to facilitate the entire day. This was the first time in thirty years of our Francis Days that we handed over the entire program to people outside of the community. We invited people of amazing dynamism to carry out the day: scholars, poets, musicians, priests, ministers and activists, people who had spent their lives telling the truth about this painfully divided and racist country. They were to guide us into recognizing that only in acknowledging the cruelty of the scourge of racism of all non white people could we possibly see a way forward to heal from its self destructive delusions. We spent an afternoon planning the morning schedule with Professor John H Bracey, the chair of the WEB DuBois Dept. of African-American Studies at UMass Amherst and Father Warren Savage an African-American priest and close friend of thirty years who has taught at Elms College and works as a chaplain at Westfield State College. John and Warren bonded immediately realizing how many friends they had in common within their shared Black history of living in Western Massachusetts. Both are life-long activists in the Black struggle for liberation from oppression, and educators of primarily white folks on the evils of racism, perfect credentials for our day on confronting systemic racism. When Professor Bracey heard that we were inviting Native Americans to participate in the day, he shared emphatically: “Their prayer needs to start the day. We took their land; we need to hear from them first.” One of John’s special interests is Native American history and he knew volumes about the suffering and resiliency of Native peoples. Warren seconded the motion enthusiastically. Suzanne and I were intrigued observing two experienced, compassionate, and knowledgeable men of color begin to shape the Agape day. And rightly so. Why wouldn’t we have people of color planning a day on racism? One of the major conundrums that emerged, however was: how many racial minorities do we include in a six-hour program? African-American and Latino and Native American– and what about Asian Americans? And Islamaphobia is alive and well? We found ourselves in consistent need of advice from people of color as to how to shape the day. John’s proposal to have Native Americans start the day was a relief. Here was a man who experienced racism himself as an African American saying in effect, “Native brothers and sisters and their story is primary. This is the original genocide. Our story can wait.” John’s was a generous nod to hold up an ethnic group other than his own. We realized through his concern that those who suffer race prejudice are one. We white people have an inherited stigma of racism, especially as Christians. Crucifiers of non-whites, we subjugated Blacks, Latinos, and Native Americans by our dominance. Our superiority is internalized. To incorporate the central theme of white privilage, we invited Eric and Brenna Cussen/Anglada from St. Isodore Catholic Worker Farm in Wisconsin to speak about the efforts they have made with a mostly-white Catholic Worker Movement by building bridges of activism with Black Lives Matter. Presenting the historical pattern of white supremacy in the US, Brenna helped us to see the inevitable internalized inferiority from which all non-whites suffer. People of color who spoke on this sacred day, echoed it clearly; that they have lived every day in a culture that tells them: If you are not white you are deficient. 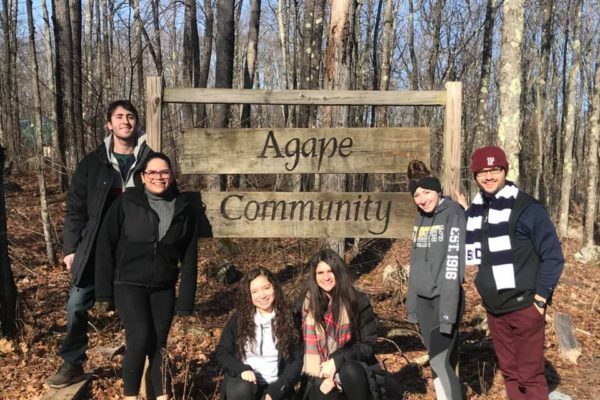 If we at Agape are living in an all-white intentional community, in white rural New England, are we fostering privilege and benefitting from it simply based on skin color? We view ourselves as compassionate, certainly not racist, but haven’t we grown oblivious to grave economic injustices of white privilege? Take , for example: If you are African American born in poverty, you stand a 5% chance of ever rising out of that poverty. The average median net worth of white households is 13 times that of people of color: $144,000 white, $13,700 Latino, $11,200 black. Native Americans are the poorest ethnic group: 28.4% of all Native Americans live in grinding poverty. Ten of the twelve poorest counties in the US are on reservation land, an inhuman wretchedness. Is this not a genocidal poverty? Edgar Hayes, an African American, born in Brooklyn, New York and an Agape Mission Council member, led prayer and animated the day. Before the program, Edgar told me, “We need to think about what people will take home from this day”. For me, the take-away has to do with whether you are a person of color who needs to rise up out of oppression and poverty, or a white person who needs to renounce your privilege and the unearned advantages by moving downward on the economic ladder to meet the oppressed people rising up. We live in the most religiously diverse nation in the world. As Christians, we pledge to step down from the faith pedestal of Christian superiority as the best or only true religion and promise to live in harmony with the other 22 religions of this world as faith traditions we can revere and learn from. 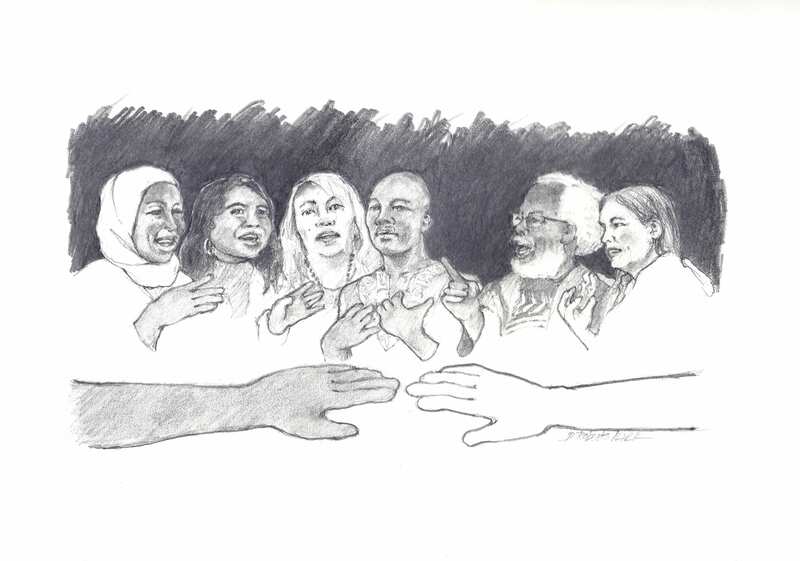 While living in one of the most ethnically diverse countries in the world as well, we as a white community are obliged to repent our allegiance to all our systemic, structural racist institutions and move downward off the pedestal of privilege to learn from, love and live in peace with those we have oppressed: Asian Americans, African Americans, Arab Americans, Latino Americans, and Native Americans. The mountaintop experience for me at St. Francis Day’s “Confronting Systemic Racism” was singing “We Shall Overcome” led by Ruth Bass Green, an African American woman who lived through the Civil Rights era. I have sung this song countless times at peace rallies, folk concerts, and song fests at Agape with groups of mostly white confreres. I have been told by Black activists and music historians that “We Shall Overcome” belongs to the Civil Rights movement as a Black person’s freedom song. Singing this anthem carried them through their anguish, including life-threatening campaigns for freedom. It does not, they insist, belong to the 1960s peace movement. 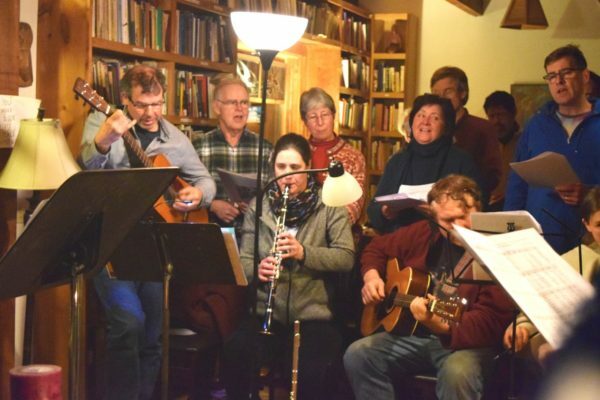 The song offers reassurance for a people whose lives are in daily peril. In spite of the odds at “overcoming” injustice, hope will, absolutely… prevail. Doesn’t this sound more like a Black freedom song? When Ruth told me that she wanted to sing “We Shall Overcome,” I thought to myself, “Is it too familiar? Will it speak to these times?” But when she broke into this historic melody and lyric, Ruth led as an African American woman whose suffering and perseverance were wrapped up in the moving cadence of the anthem. She belted out this song uniting a wide spectrum of people of color in the audience who were singing from the gut of their experience of trial. They led the rest of us white activist allies in the audience, pulling us into the historical forces of memory, hope and commitment to persist in the struggle to end this cruel systemic racism. It is their song. Is it any wonder that Jesus, the one who loves the poor, loves them so?